Welcome to the Radio Enfield History timeline, scroll down the page to read about our history, or use the jump buttons to quickly view a specific year. Please note that more information will be coming soon, so come back shortly to see more content! 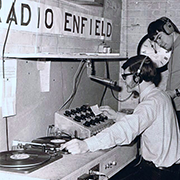 On the 24th May 1970, Radio Enfield took to the air for the first time at 8pm with a weekly Sunday evening request programme for patients in Chase Farm Hospital. The station was started by a group of friends with an interest in radio, electronics and music, and who had been motivated by the 1960's offshore radio stations such as Radio Caroline, Radio London, Radio City and Radio 390. 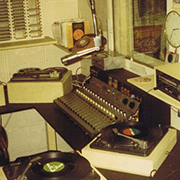 The picture, taken at a Saturday morning rehearsal, shows the first studio, which comprised 2 turntables, 2 tapedecks, a mixer, a microphone and a converted tape recorder used as a "jingle" machine. The programmes replaced BBC Radio 2 on the patients' headphones and the studio was based in the Centre Switchroom of Chase Farm Hospital, a store room shared with the street lighting controls. The original studio was very small and once the service had been established, Radio Enfield began talking to the hospital management about the possibility of moving to larger premises so we could expand to other nights and other local hospitals. We were offered what used to be a brick-built bicycle shed in the corner of the then Block 7 Nurses' Home and set about building a brick wall to partition the studio from the office area and record library. We had never built a brick wall before, but were very pleased with the result - it even had a double-glazed window so that the presenters could see what was happening in the outside area! We moved in by wheeling the equipment over on a porters' trolley one Thursday evening and the new studio - our second - became known as the Matron's Bicycle Shed. After some quite lengthy negotiations, we extended our service to cover Highlands and South Lodge Hospitals in Winchmore Hill with a 2-hour programme on Sunday evenings. By this time, programmes at Chase Farm were being heard "live" on Tuesday, Thursday and Sunday evenings. A special one-hour request programme was recorded over the weekend at Chase Farm studios and broadcast from 8pm-9pm on Sunday via the radio system at Highlands and South Lodge Hospitals, and the second hour was a recording of the Thursday night 9pm -10pm programme at Chase Farm (with care being taken not to mention the date, weather, news of the day etc!). By the end of the year, Enfield Area Health Authority, as it then was, were anxious for Radio Enfield to extend further to cover North Middlesex Hospital and after a fairly quick series of discussions we came on air with a 2-hour programme on Sunday nights replayed from a tape machine over the internal radio system at North Mid, recorded on the same basis outlined above for Highlands and South Lodge hospitals. By this time, we had teams of request collectors visiting all the hospitals and sending the request slips back to Chase Farm via the internal mail system. 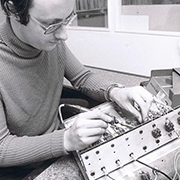 The system of pre-recording and replaying programmes for Highlands, South Lodge and North Middlesex was very time-consuming and cumbersome and we set about raising funds to install Post Office landlines - music circuits that could deliver high-quality output from our Chase Farm studios across Enfield into the radio systems at Highlands, South Lodge and North Middlesex. This would enable us to extend our evening broadcasts to six nights a week and take telephone requests whilst the programmes were being broadcast "live" across the network (we re-broadcast Radio 2 during the daytime: the hospitals' headphone system shut down at around 10.30pm). The "live" service was opened by the Mayor of Enfield and the hospitals' administrators and Leagues of Friends were also present at the official opening ceremony. By now we were outgrowing the Matron's Bicycle Shed plus we wanted to extend the service still further to include local football commentaries and news and have a second studio so that separate programmes could be broadcast to any combination of the hospitals when the number of record requests received was high. We were offered an ex-teaching classroom fairly near the Matron's Bicycle Shed and set about raising funds, with a good deal of help from the Lions Club of Enfield, to build partitions, record shelves, an office area and of course purchase and install 2 new broadcast studios. 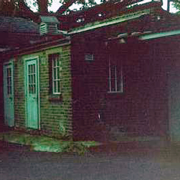 We officially ended broadcasts on 15th October from the Matron's Bicycle Shed but due to problems encountered with moving the Post Office lines and the internal wiring at Chase Farm, further broadcasts were not heard from Radio Enfield until early 1979, apart from a couple of low-quality test transmissions to Highlands Hospital at the end of 1978. Live football commentaries to all the hospitals from Enfield Football Club in Southbury Road were introduced from April 1979: the football club chairman Tommy Unwin had been a patient in Chase Farm, was impressed by what he heard and saw the opportunity to give coverage of his football club to a wider audience so he wrote a cheque out whilst he was still a patient in the ward in order to pay for the landline links from the stadium in Southbury Road to our new studios! Tottenham Hotspur Football Club had provided commentaries to North Middlesex Hospital since the early 1950's and in 1980 agreed to route their commentaries via Chase Farm and by a fluke it was found that Radio Enfield could also be heard at the Prince Of Wales Hospital in Tottenham! 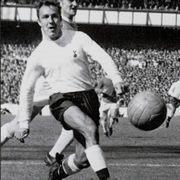 The arrangements worked well as Enfield and Spurs normally organised their matches so that one team would play at home whilst the other played away. Our Saturday afternoon sports programme featured the commentaries in full and mid-week matches were also covered, normally with an earlier start to our Tuesday evening shows. 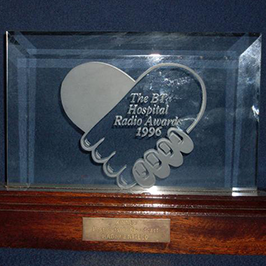 In 1996, we were presented with the prestigious BT/Radio 2 award for Hospital Radio Outside Broadcast of the Year by the BBC's Judi Spiers at the BT Tower. This was for a 1995 programme presented from the Robin Hood public house in Botany Bay which featured a number of guests including Tony Felix from Chase Farm's Board of Directors, their Catering Manager Mathew Pease-Watkins , Jon Storey from the local RSPCA and six-piece jazz funk/fusion band Small Change. This was the weekend of the 50th Annual Enfield Autumn Show and coincided with the annual Open House weekend. 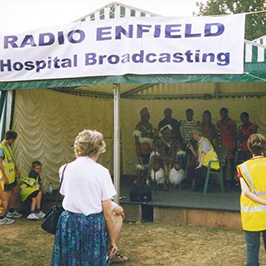 As Enfield Council wanted to make it a very special weekend, we took part by obtaining a licence from Ofcom to broadcast over the weekend to Enfield and the surrounding areas "live" from the Town Park whilst the showground was open, then "live" from our studios outside those hours. We could be heard across a wide area of North London and South Herts on 101.4FM. Both at the show and at the studios we interviewed many of the individuals and organisations taking part together with the local MPs, Mayor of Enfield and Councillors. The broadcast was a success, and we were able to repeat the broadcast weekend - this time on 87.7FM - the following year (2004). 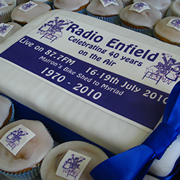 Our 40th anniversary was fast approaching, and, with memories fading of the history of Radio Enfield, it was decided to publish a book charting the Radio Enfield story and this hit the bookshops nationally and on-line retailers in November 2009. 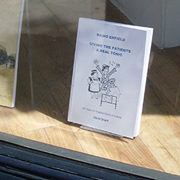 The 228 page book with over 100 photographs included recollections of many of the volunteers that had been involved with the station over the years and is pictured in Waterstones' Enfield window shortly after publication - profits from the sale of the book going to Radio Enfield. To mark 40 years of Radio Enfield, our third FM broadcast took place, this time on 87.7FM again, and included interviews with many local organisations and details of services offered by Enfield Council such as recycling and fostering. We were also able to publicise events taking place at Forty Hall, Millfield House and those being organised by other voluntary organisations. We received reception reports from as far away as Luton, Stansted and Epping Forest! It was also an opportunity to reunite many former members of Radio Enfield including the original line-up of presenters who had not been together in the same place at the same time for over 35 years! As part of a major redevelopment to Chase Farm Hospital, Radio Enfield had to move studio for the fourth time. The old studios were demolished in Feburary 2016. After lots of hard work behind the scenes, Radio Enfield has made a return to the air at North Middlesex hospital - broadcasting over their patient entertainment system, we can be heard on channel 0 where news and patient information is also displayed on screen. Broadcasts have also been extended to cover the Royal Free Hospital in Hampstead after Chase Farm Hospital became part of the Royal Free London NHS Trust. 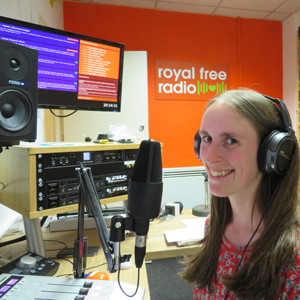 We are happy to announce that Radio Enfield will be joining the Royal Free family and sit within The Royal Free Charity. The station will be rebranded “Royal Free Radio” and be available to patients to listen to through the bedside consoles at the Royal Free, Chase Farm & North Middlesex. In July 2018 we moved from the temporary studios we had occupied for the previous 3 years to a new location. Much of our outdated equipment was replaced with the latest digital versions and our vinyl record library (which was gathering dust on the shelves) disposed of, making us a truly all-digital 21st century radio station!